Whenever something claims to be “the best” of its kind, I take it with a grain of salt. The pizza place in my neighborhood, for example, which claims to have the “best margarita?” Well, they’re just silly because a margarita, first of all, is a drink not a pizza, and second, if they were referring to the margherita, which is a pizza, then they’d be wrong again cause theirs is mediocre at best. But I’m getting horribly off topic here (and unnecessarily hating on a local pizza joint, so sorry). The reason I’m bringing up any of this “best” claim business is because I think I may have had the absolute best grilled cheese sandwich ever this weekend and I need to relive it by writing about it. 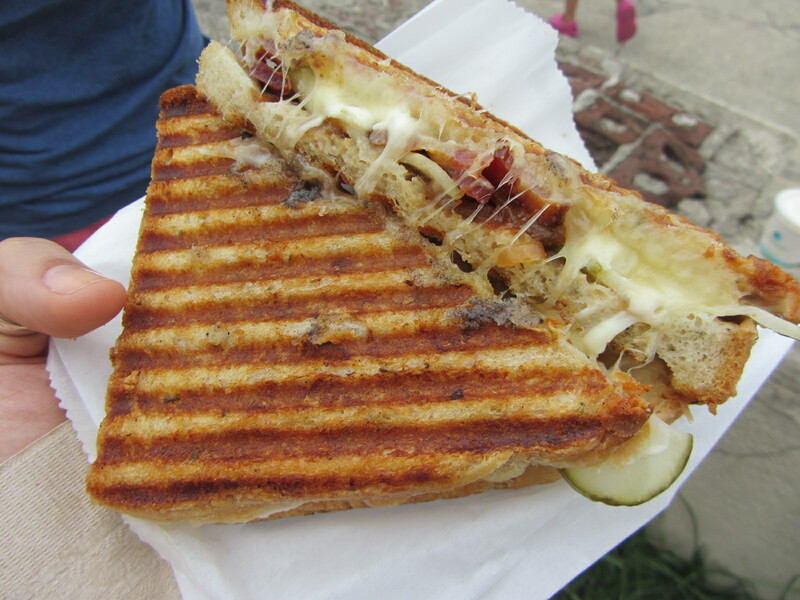 The Bacon Cheddar Blue from the Milk Truck Grilled Cheese stand at Williamsburg’s Smorgasburg was intense and in my opinion, the best of its kind to ever meet my grilled cheese loving mouth. Perfection if you will: toasted rosemary pullman bread sandwiching New York state cheddar Wisconsin blue, sweet caramelized onions, thin spicy pickles and the power ingredient, thick sliced double smoked bacon. The bread had just the right amount of crunch to complement the gooey, melted cheese oozing out, and the onions added just a hint of sweet jamminess, while the pickles, though not really spicy, lent a bright tangy flavor that I really enjoyed. The bacon? Well, c’mon, when is bacon ever anything but delicious? This bacon, all thick, smokey and juicy, was everything I could ever ask for. I scarfed it down like it was my job and licked my fingers afterward, and now I’m here to pronounce it the best grilled cheese sandwich I’ve ever eaten. And you shouldn’t take that lightly.